Share your favorite Thoroughbred horse names! 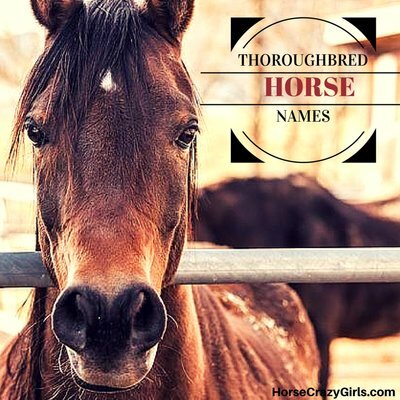 Here you'll find thoroughbred horse names shared by other horsecrazygirls like you! Use the comments link to share your ideas for Thoroughbred horse names. We'd love to hear them! It is the name of my horse, and I think it is a beautiful name. To me it indicates speed and brightness, like a comet in the sky. Cause my horse's name is Teddy! He is a big 17h chestnut with a star. He's a thoroughbred x quarter horse! And I LOVE HIM TO BITS! He has the sweetest softest nature ever! I luv ya Teddy! I chose that name because my mare is thoroughbred and she's off the track. She's solid black with three white feet but I call her blackie. I love the Fifth Thoroughbred series book and this is my favorite character (Ashleigh's fantastic racing filly)! Ashleigh's horse from the thoroughbred series. I have loved reading the Thoroughbred Series and have always loved the name Wonder for a horse. When I got my chestnut thoroughbred I named her Wonder too! My horse is an x-racer. He bowed two tendons so I can't ride him, but I can groom him and I am training him now. He is 15 hh. Jamaican Me Crazy (aka Conji) is the 15.2 bay Thoroughbred I ride in lessons. His name is just soooo cute I had to submit it! I <3 Conji! Shay.. Well, I really like that name. My friend has a horse named Chantal. She is a paint thoroughbred horse. And I also love the name Dakota. Stormy is the name of my bay appy. He is so well-behaved and I made my own cross country course on him, He is so cute. Starlight was the name of my Albino pony mare but unfortunately she died. Swaybe is the name of my thoroughbred but he has a sway back. Swaybe is a good nickname. We might race him. Arwin is the name of my grey filly. I think this name is great for a thoroughbred because it makes me think of lightning which is very fast. How about StarDust? I think that it would be a perfect name for her! I'm writing a novel on horses, and I need a name for one of the thoroughbred horses in my story. She is a silvery palomino with light brown hooves. She has a sweet , shy temperament, and has foaled many times. I hope these give anybody ideas! My grandfather has a thoroughbred and her name is Zara. It fits her perfect! I just love the name. He is my favorite horse at the barn. He is a large 16 hh thoroughbred and I love him to pieces. That’s his show name but we all just call him Nick. I think morning glory is such a cool name. My friend's Mum had a chestnut thoroughbred that was an ex-racehorse that was 17 hands high. He was called Christmas Creek and I was allowed to ride him. He was gentle for an ex-racehorse! But sadly, he passed away 2.5 yrs later from colic. bout 1 yr after he died, I then got a welsh mountain cross Shetland pony that was called Dusty. He was about 6 yrs old when I got him and he had trouble with anyone touching his head for he had been punched in the face. But after I fixed that problem we were the best pair. I sold him when I was ten to a good family. He is now being ridden by a 7-yr old girl. Now I have Tigger, Ravine and Drover. I have a black thoroughbred mare who is called pepper. I called that because she is dark and is sweet. I have pepper's son who is called Jaffa because he loves food and is greedy but is very loveable. I have a white thoroughbred horse that is 17 hands high. I called him drover because he massive and pushy. I also have a chestnut Arabian who is 14 hands high, I called him trigger because when he gets scared he takes off like a trigger. My other horse is a chestnut quarter horse cross who is 14.5 hands high, I call her raine because she is sweet. This is my crazy 8 year old thoroughbred's name. He is an amazing jumper and is a nice mover, so perfect for eventing. I like Spirit. Olivia is nice, maybe Firebird, maybe runs like wind. I like names that represent spirit so maybe Blaze. Umm, well I'm not a thoroughbred expert but Dash is a very good name (in my opinion). I ride this mare named Mimosa. I love her name, but we call her Mimi for short. She is so sweet. So that is my suggestion for a name for a mare. I chose this name "Ready Set Go" because it's a thoroughbred type name. It brings intimidation to the horse to say you ready to get beaten. I really like the name Apollo for a thoroughbred. I have named my thoroughbred model horses Zephyr, Apollo and Kestrel. I have a lot of good names that I came up with and I guess there for any horse in general, I hope you like them! I made up this name... Never Again. I like it. I love these names from the thoroughbred book series: Wonder, Fleet Goddess, Wonders Pride, Mr.Wonderful, Shining, March to Glory, Wonders Champion, Machless, Storms Ransom and Sterling! I am buying a horse named Flash, do I keep the name or no? Help! These are just a couple horse names that I love! Quinton - my aunt's bright chestnut ex-racehorse gelding. I love these names! they are soooo pretty! Foxy is my dappled grey thoroughbred mare. When she was first born, she was chestnut with white socks. She stayed like that for 2 years. Her name was Fox In Socks at first, then she became my beautiful dappled grey mare. Another word for beautiful is Foxy, and it wasn't to far from Fox In Sox, so that's how she got her name. Those names are so pretty! I don't have a horse but I am crazy about them. I always wanted one and there are a lot of names that I would like to name it. My favorite breed is a paint horse, a gypsy vanner and a mustang. Here are some names. Sydney, I love horsecrazygirls.com it's great! I have been wanting to ask how did you get Sinatra? Please comment or something to let me know! Because it sounds free and flowing plus it's my Thoroughbred race horse's name. My Thoroughbred's name is Cake Walk. I like it because when he comes out winning a class. I always think, that was a piece of cake. Hence, Cake Walk. Loulou means Pearl in Arabian language, and I'd think it would fit to any oriental horse. For example the Akhal-Teke (my favorite) or the Arabian but it would also be good for Thoroughbreds as these are also hot-blooded. My absolutely best friend 17-year-old chestnut Thoroughbred is named that way, and it really fits! I just love the name it's so beautiful and perfect for my Thoroughbred mare. That is my horse's name. He's a grey and white Thoroughbred. It suits him. It is the name of my stallion Thoroughbred foal and he is black with no markings. My pony's name is Sprinkles. Her color is chestnut with white spots. She is 1/2 Thoroughbred and 1/2 Appaloosa. Sprinkles on top means for example "Now entering the show ring is Katie on Sprinkles On Top!" it's like the rider is on top of Sprinkles. Sprinkles On Top also means sprinkles is the top pony like she comes out for first place. Hi! You may know me. I wrote Lost Trust, Cassey, Willow the Wild pony, and Little Black and The Big Roan. Lady Bug a.k.a Kubic Velocity. She is a bay mare, and she is very beautiful. LadyBug if its a girl, or Legacy. My family has 5 horses, 3 Tennessee walkers, 1 Belgium and I own my own Standerdbred, so their names are Daisy, (Belgium) Freedom a.k.a legacy (TWH) Meadow (TWH) and Mrs. Amy, so I think those could be cool names for any horse. BYE! This is my Thoroughbred's name. He's my best friend in the whole world. Secretariat and War Admiral are in his bloodlines! I don't have a horse. I do ride. I ride a beautiful pinto, his name is Christopher. I Love him to death. I would suggest some names like, Texas Toast maybe. I used that name after one of mine. You can use it too. You can also use Price Tag, Loose Change, and Maximum Ride. Sure, I've used them, but they are good names. I won't blame you for using them. I love the name Delilah for a horse. It really suits a Palomino. Here are my two favorite Thoroughbred names (mostly because I know these two horses) M. Jay Hawke and On The Rock. I have a Thoroughbred named Ginger. She's competes in jumping, racing and dressage. She wins a lot and she's the best! That's why I like the name Ginger! Jet-ski because it sounds cool and jet-skis go fast like racing Thoroughbred and I would like a Thoroughbred called jet-ski. My Thoroughbred gelding's race name was Trepid Journey, now I know why because its taking a long journey to recovery from being neglected. He's the most quiet horse ever, I love him lots! Pixie Thunder, Alligator Green, Kool-Aid Killer, Nectar Ape, And Fierce Lava. I have 3 off the track tb from Adena Springs retirement program named Hotlight Gunbolt and Toni Turbide (we call him Turbo). I have a 5 yr. old mare(tb) named Dozen Roses affectionately called Rosie. Her Jockey Club is Megaconfusion. If I would name a Thoroughbred I would name it Starwood. I don't know why though I just would! That's the name of a 3 yr old colt I visit at a horse farm. He's a chestnut Thoroughbred. I visit him at least twice a week, and his owner also gives me a few riding lessons on him! Because if you see a beautiful horse for the first time it's amazing! Plus I'm listening to the song by script and I love it! Thoroughbreds are my fave breed! I ride a Thor/Connemara and it's my #1 fave horse. I have a loan horse called George. He's a cherry/light bay with four black socks and a Thoroughbred X. I'm just bringing him into jumping and hoping to show him this summer. But i can't think of any names! If it helps, he has a cheeky personality, likes carrots, and loves cuddles. If you have any suggestions on show names. I think Camanchi is a wonderful name, it's from The Saddle Club. I love that show. I own lots of horses and my name is Chocolate Man. I like that one because he likes chocolate and Mr.Rite Man because he is the right horse for me. Well, I am a 12 year old exercising jockey but you have to work hard to get there but it's kinda weird because i want to be in real races and stuff. But my favorite horse to ride is named How Does He Do It, he won 5 races. I have some names for male horses and female horses. I hope you like them! When i grow up i want to be a jockey, so watch out for me! Also anyone knows where a good riding stable is in helmet? Mic is a great name for a thoroughbred. Apollo's Sun is my 17hh Sorrel Thoroughbred's name but around the barn we just call him Big Red. My favourite Thoroughbred name is Delilah. She is a Thoroughbred at the barn I ride at and she is a beauty! I have a black female Thoroughbred named Double Black Diamond. My brother recommended it since he hated the cliche Diamond, which is what I wanted to call her. We're avid skiers, so it makes sense too. You could call it Barby or Rossa which is Spanish for rose. I have a black Thoroughbred mare who loves jumping her name is Melody, it's a good name. Some of you people should use it if u want to. My favorite horse name is Ripplestone. It really suits my horse! I am so sad because my horse Barbarossa has weird name but do you think there is something that will make it sound better? I have two horses one is a Thoroughbred called Titan and the other is a Skewbald called Ace. I think their names suit them really well and my horses are so pretty. I am starting to write a book about a Thoroughbred that is wild and a girl named Lory catches her and has to earn her trust. I NEED A NAME! If you had a chestnut Thoroughbred, Billy the Kid, if it's black then I would have its race horse name be Stormy Night. I want to call the Thoroughbred that I'm most likely leasing Prada because she's really fancy! I love that name! My sister and I have an imaginary stable of horses. I listed their names below. Marshal Murat would make a cool name for a Thoroughbred racer. Named after Napoleon's charismatic cavalry leader. Nothing catchy or cute but it sounds cool.